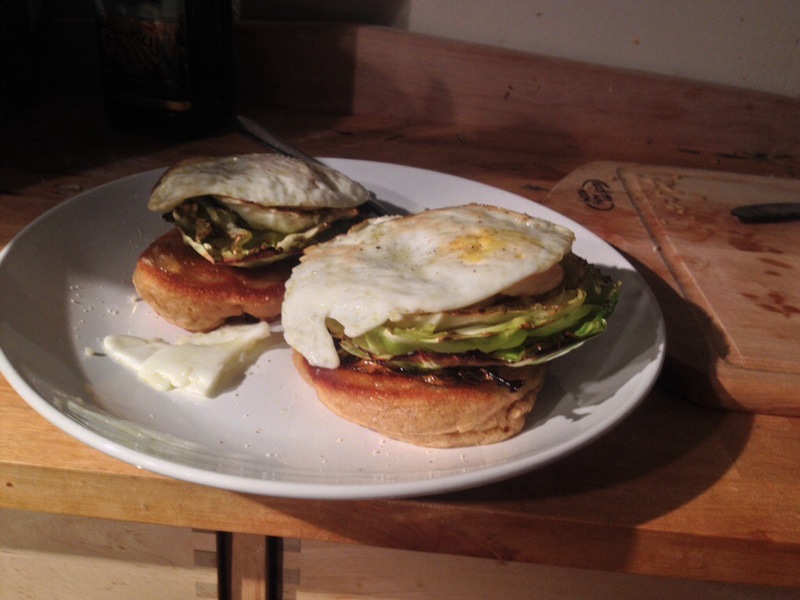 I can’t compete with all the beautiful food blogs out there. I don’t even want to. But food and cooking is an integral part of my life. It’s not an afterthought. It’s not a chore that endlessly repeats and is pleasant only when someone else does it. That’s how I feel about cleaning. Once a week I plan some cooking. Sometimes it works out, sometimes it doesn’t. Instead of trying to highlight one great dish every now and then; I’m going to share what I made even if it’s not a success. Maybe you’ll get ideas for your own meals. Or maybe you’ll get inspired to search for a recipe. Maybe you’ll just enjoy my ongoing attempt to amuse myself with food. This week I was feeling vegetarian. I made two experimental dishes. I was inspired by a Facebook post of cabbage steaks. Thick cuts of a cabbage head salted oiled and roasted. They looked beautiful. I decided to make a meal of it. Cabbage steaks oiled and sprinkled with Spike seasoning. Oven to 400 and about 30min. All on top of pancakes with a garlic pepper jam. Will disapproved. It plated beautifully and tasted yummy but the cabbage needed a knife. Each component slid away from each other. Later I tried what I will call White Winter Pasta. It’s not really all white, just much more so than a tomato based sauce. Roasted cauliflower, mushrooms and a little bit of carrot. Made a sauce of: sauteed onion and garlic, two cans of white beans, about a tablespoon of white miso paste, and a very substantial amount of leftover white wine. I took the immersion blender right to the pan. Bean goo everywhere. Next time, use a deeper pot. Combined roasted veggies, bean sauce, and cooked pasta. It was missing something. I added parsley and a generous splash of white wine vinegar. It was more successful than the cabbage, but not a win. The texture needed to be smoother and moister. 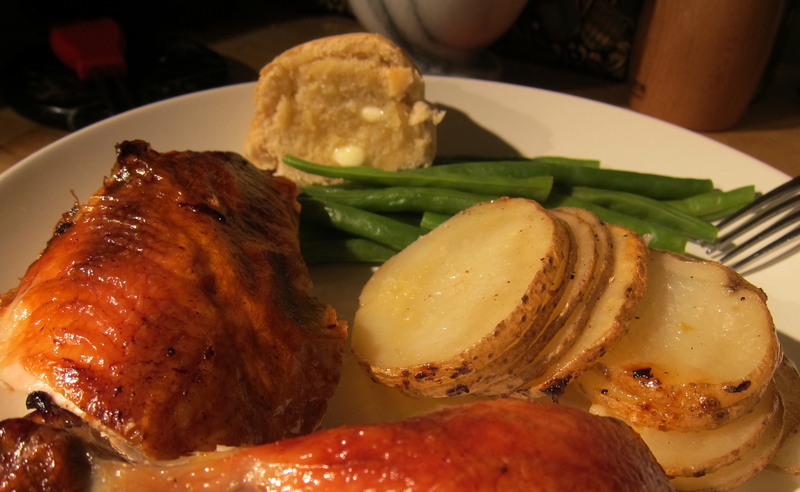 We finished the week with the most reliably fantastic roast chicken dinner. It’s right out of Michael Rhulman’s Ratio book. Sooooo simple and turns out perfectly every time. Brined chicken for 24-48 hours. Green Beans briefly boiled in a simple salt brine. Best beans EVER. So that’s what Will and I ate last week. Next up, cilantro chicken, quesadilla, and salmon pasta. 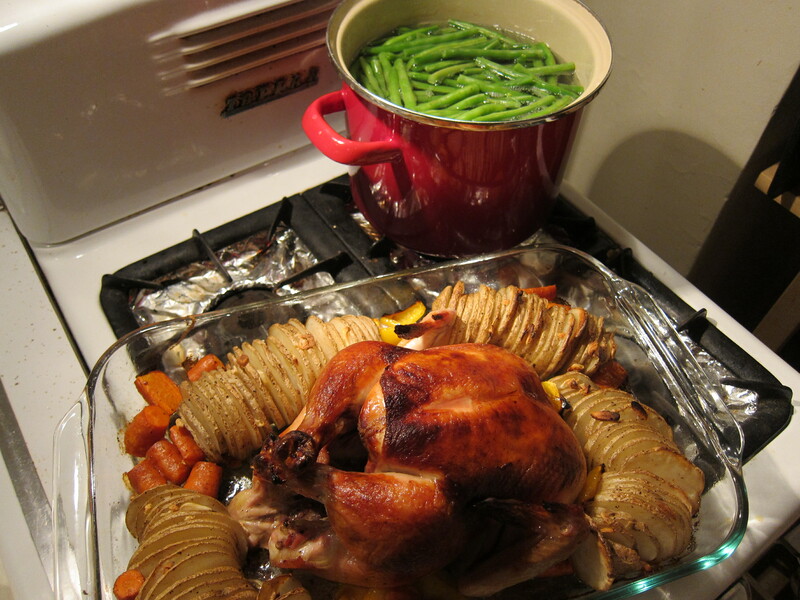 This entry was posted in Kym Cooked and tagged cooking, food, fried eggs, healthy food, pasta, roast chicken, vegetarian. Bookmark the permalink.